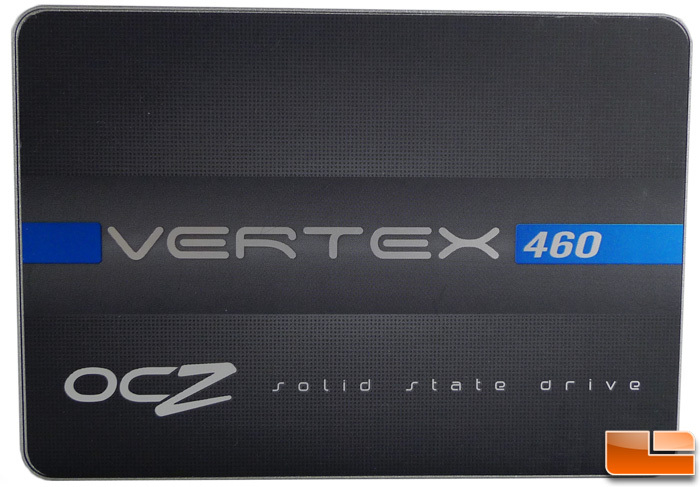 OCZ Vertex 460 240GB SSD Review - Legit ReviewsThe Last Vertex SSD Ever? 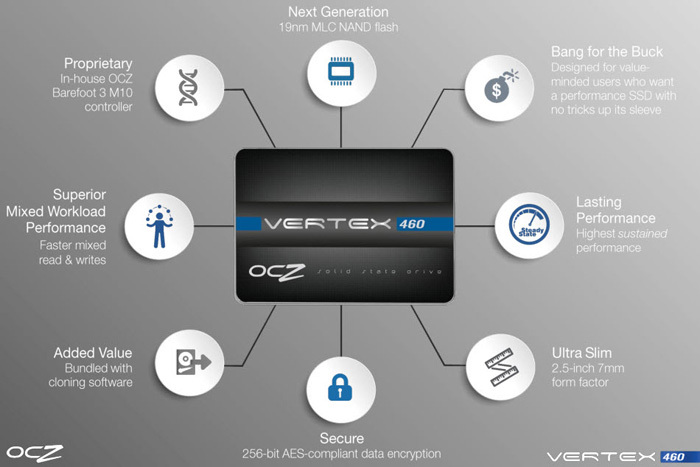 The Last Vertex SSD Ever? So now it’s OCZ Storage Solutions – A Toshiba Group Company, which is a mouthful. We’ll still refer to them as OCZ informally for the sake of brevity and it will take a while for the new branding to make it to the products. Toshiba is a huge and well respected company so we expect great things to come, especially if the OCZ team gets R&D money to spend as they’ve shown to be very resourceful and innovative in the past. So, with that out of the way, let’s get busy with the task at hand – checking out the new Vertex 460! We received a 240GB version this time around for evaluation which is pretty much the typical size of a review sample anymore. The Vertex 460 carries the same Barefoot 3 M10 controller we saw in the Vertex 450 and is now paired with 19nm Toshiba (go figure) MLC NAND. As far as features are concerned, not much has changed. It still carries the 2.5″, 7mm form factor and SATA III interface with S.M.A.R.T. and 256-bit AES-compliant encryption supported by the controller/firmware. The warranty is three years which is two years less than the Flagship Vector drive. The performance specifications are impressive for what is essentially an entry-level ‘performance’ drive with reads hitting 545MB/s max and 525MB/s writes max. These numbers aren’t far off what we saw with the Vertex 450 as we’ll discuss. The exterior gets a bit of a makeover which a cleaner look and a splash of blue. I personally like the new look better but aesthetics aren’t really a selling point for most. Like the Vertex 450, the 460 comes with a 2.3″ to 3.5″ adapter plate as well as a serial key for Acronis True Image HD 2013 drive imaging software which we use all of the time to clone and backup our SSDs. As compared to the enthusiast Vector drive, the Vertex 460 performance is very comparable and the biggest difference is the rated driver endurance and related warranty. 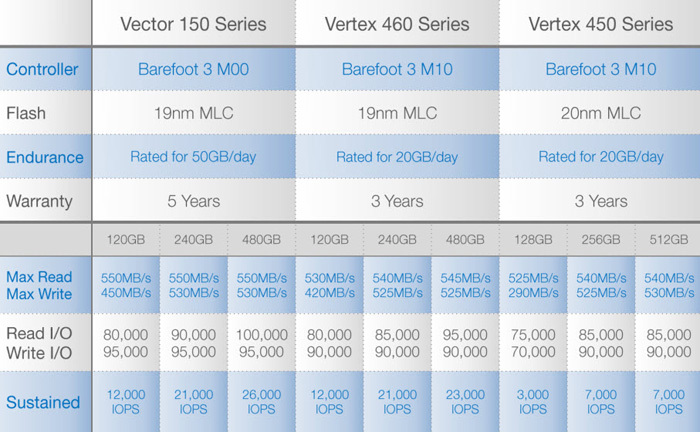 There are incremental improvements over the Vertex 450, especially with the smaller 120GB and in the sustained IOPS performance. Let’s a have a closer look at the components.